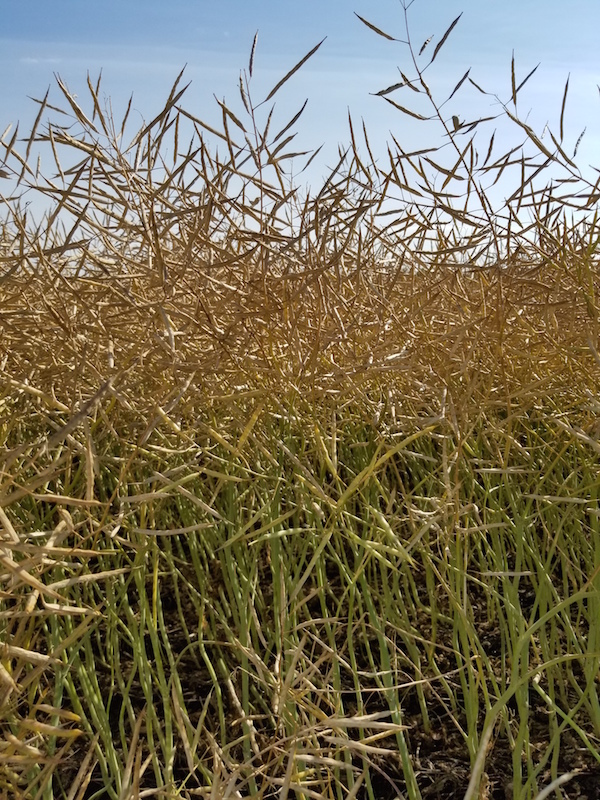 Do you want plants and pods dried down to the same point as a swathed crop? If yes, you might be waiting a while…if you didn’t use a pre-harvest aid. But you don’t have to wait that long. 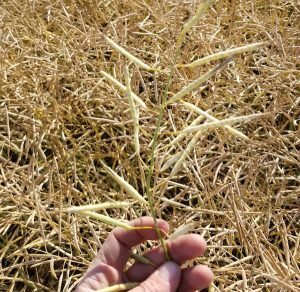 Canola seeds can be ready to harvest even if pods and stems are a little greener than you’d expect. 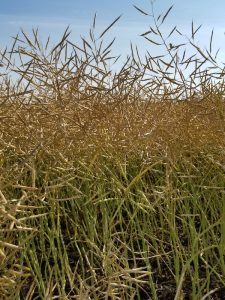 To determine whether a crop is “ready” to harvest, stalk dry down, pod dry-down, and seed moisture all need to be considered. Which is most important to you? What are you compromising by focusing on one and not the others? Is it most important to reach an acceptable seed moisture? The advantage of going by seed moisture is that straight combining will start earlier. When a crop is in the bin it is not at risk of weather events in the field. The disadvantage is that combining may be less efficient. Green plant material may limit capacity, plugging may be more frequent, threshing losses may be difficult to reduce, and green material may be difficult to chop and spread, causing issues for future operations in that field. 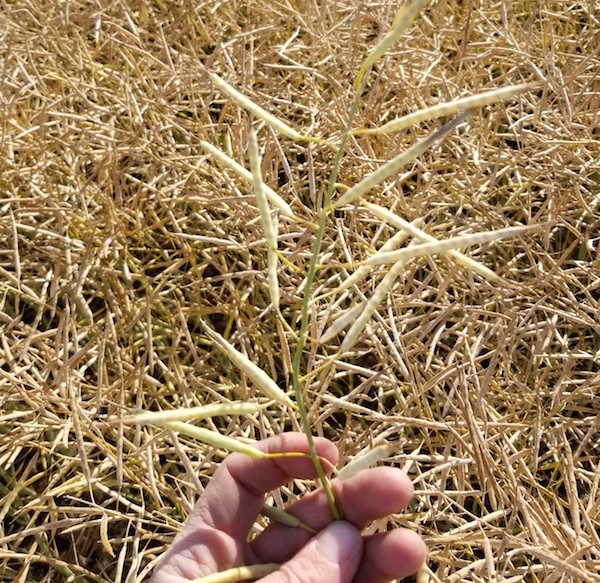 If harvesting when dry seeds are inside green leathery pods, unthreshed pods could be passing through the combine. This could be hard to correct without cracking good seed. Is it most important that pod material is completely dried down? This approach should strike a balance between acceptable seed moisture (not too low) and a decent amount of plant material dry down for ease of harvest. Unthreshed losses should not be an issue. Disadvantages are that it takes longer to reach this stage, the pods will start to become more susceptible to shattering, and stalk material is likely still going to be on the green side, which can drain the machine capacity. Watch your sample for green material that would lead to greater storage risk. Is it most important that stalks are completely dried down? The key advantage with this approach is a much easier and faster harvesting experience. The disadvantage is that it can take significantly longer to reach this stage (especially later in the season or in areas that tend to be wet and/or cool) or it require a pre-harvest aid to achieve. Seed moisture could also end up very low. The plant material will tend to break down a lot more readily, and the primary loss point may end up being the shoe rather than the rotor. Seed moisture is below 9.5% in this field (which is being straight combined), but a significant number of pods are green and leathery. Stalks are green, too. This indicates that stalk and pod colour are not necessarily an indicator of “readiness”. Ideally one should at least wait for green pods like this to mature before straight cutting. If a using a non-shatter tolerant variety, or if there is urgency for other reasons, one may want to consider combining with pods like this remaining, but these pods will most likely be blown out the rotor intact. This field was straight combined on the same day, even though the section to the left of the red line was seeded three weeks later. 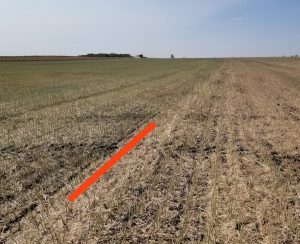 Seed moisture was acceptable for both sides, but the later seeded section was harder to combine and losses were higher.